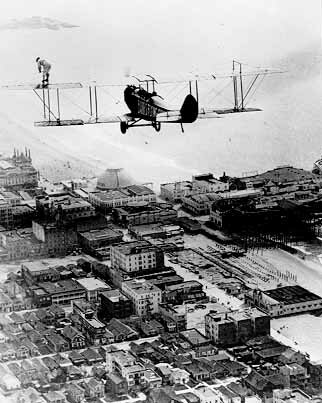 Abbot Kinney invited the aviation industry to Venice because he knew it would be a constant source of publicity for his beach resort. A.E. Mueller was the first to take up the offer in 1909. He displayed his home made craft at Venice's Midway Plaisance adjacent to the Grand Canal beside Venice's lagoon. Venice's own airport was established by Thomas Ince as a base for stunt pilots employed by the Abbot Kinney Company to entertain beach crowds and for movie work at his nearby Inceville movie studio located in Santa Ynez Canyon (now Sunset Blvd. in the Pacific Palisades). Ince Field was located on a triangular plot of land at Venice Boulevard between Washington Boulevard and Washington Way. 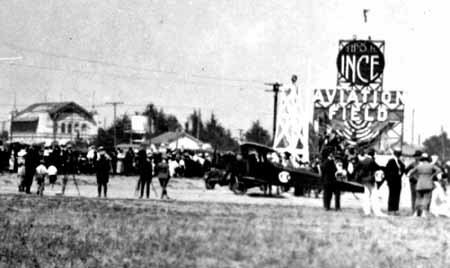 It became the first airfield on the west coast to be officially designated as an airport in 1914 thanks to Ince's Trans-Pac air race. Kinney spent large sums of money for entertainment to attract people to his pier. He often hired aviators like Frank Sites to perform aerial stunts over the pier with his bi-plane. In May 1914 20,000 people watched him take off from the beach just north of the pier, when his passenger William Morton parachuted from 2500 feet and intending to aim for the beach, missed and landed unharmed in the water. Sites continued the show doing daring dives and spiral drops towards the sea below. The public was so fascinated by aviation that they scheduled a balloon race on Sunday July 18, 1914. Only five of these highly flammable hydrogen balloons entered the long distance race. The winner would be the balloon that went the farthest. The race was won by Ed Unger, whose large 72,000 cubic foot balloon "California", carrying the pilot and a woman passenger landed safely in Anaheim. Other barnstormers like Al Wilson, Frank Clark and Mort Bach performed regularly in the skies over Venice. Some of the most daring and elaborate aerial stunts were dreamed up in the field's hangers and motion picture cameramen were often on hand to film them. One of the more exciting aerial stunt shows for the beach crowd occurred on July 4th, 1932 long after Ince Field had closed. Louis "Speedy" Babbs planned a daredevil descent by parachute while operating a firework's show. He leaped from a plane at 8000 feet with bombs strapped to his body and a brand in his teeth. Unfortunately, one of the bombs prematurely exploded and his clothes caught fire at 5000 feet. Spectators didn't realize what had happened until his writhing body, enveloped in flames, dropped out of the fog into the clear a few hundred feet above the ocean. Speed boats quickly rescued him and he was hospitalized with first and second degree burns. The airport also supported a fledgling aircraft industry. Eight manufacturers, who had small factories there, like Catron & Fiske, B.H. Delay Aircraft, Crawford Aircraft and Waterman Aircraft Manufacturing produced bi-planes and tri-planes. Some had military contracts once the United States entered WW1 in 1917. 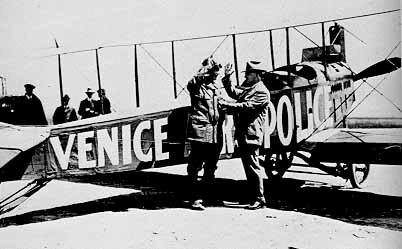 On April 3, 1919 Venice inaugurated the first aerial police force in the United States by swearing in aviator Otto Meyerhoffer into the police force. The words "Venice Aero Police" were inscribed in big bold letters on the side of his 100 MPH bi-plane. The police station would call him at the airport when they needed his assistance in tracking fleeing automobile bandits into the mountains, or finding boats in distress. Venice's Aerial Police was established in 1919. The pilot in this photo is being sworn in as a deputy by Venice's chief of police. The airport was renamed Delay Field in 1920, then closed in 1923. The airport's single runway was short and there was no room for expansion since it was completely surrounded by residential neighborhoods. Besides Santa Monica's larger Clover Field and Los Angeles' Mines Field (current LAX airport) met the area's needs. The land where the airport stood was subdivided later that year.